Wheelabrator Abrasive Blast System s/n NA Sand Distribution System w/ Storage Silos, Conveyors, Blowers. Beardsley & Piper “Speedmullor” Sand Preparator. Beardsley & Piper “Preparator” Sand Preparator. Beardsley & Piper “Sandslinger” Continuous Mixer. Carver mdl. RFM250 250 Lb Continuous Mixer s/n 3047 w/ Turntable. Carver mdl. RFM250 250 Lb Continuous Mixer s/n 3062 w/ Turntable. Dependable Shell Core Machines mdl. I520 2030 Shell Core Machine. Beardsley & Piper mdl. SF-104A “Corematic” Shell Core Machine. Shalco Systems mdl. 2030SMM Shell Core Machine. Hausfeld Gas Fired Metal Melting Pot. Wadkin size FD-4120 Pattern Miller s/n AR2260967-01CY w/ Accessories. Wadkin Wood Lathe s/n RS-2015 w/ Tailstock, Cross Slide, Tool Rest and Faceplates. Wadkin 26″ Jointer s/n RM-3125. Master mdl. SP2SF Oscillating Stroke Sander s/n 633 w/ Acces. Tannewitz 29″ Vertical Band Saw s/n 5088. Inca 20″ Vertical Band Saw. Rockwell Unisaw Table Saw w/ Bessemeyer Fence System. Rockwell/SCM mdl. S35 13″ x 8″ Plainer. Master 24″ Pedestal Disc Sander. Pioneer 14″ Pedestal Disc Sander. Magnetic Core Drill, Circular Saws, Jig Saws, Drills and Sanders. Misc Raw Stock of Plywood and Boards. Coffing 1/2 Ton Electric Hoist w/ Trolley. 5 Ton Bridge Crane w/ Approx 30′ Span, Ingersoll Rand 5 Ton Pneumatic Hoist. 5 Ton Bridge Crane w/ Approx 20′ Span, Ingersoll Rand 5 Ton Pneumatic Hoist. 5 ton Bridge Crane w/ Approx 18′ Span, Ingersoll Rand 5 Ton Pneumatic Hoist. Seco 5 Ton Bridge Crane w/ Approx 15′ Span, Electric Hoist. Seco 3-Ton Bridge Crane w/ Approx 33′ Span, P & H 6000 Lb Cap Electric Hoist. 6000 Lb Bridge Crane w/ Approx 30′ Span, 6000 Lb Cap Electric Hoist. 6000 Lb Bridge Crane w/ Approx 30′ Span, Ingersoll Rand 6000 Lb Pneumatic Hoist. 3 Ton Bridge Crane w/ Approx 25′ Span, Yale 3 Ton Electric Hoist. 3 Ton Bridge Crane w Approx 24′ Span, Shepard 4000 Lb Electric Hoist. 6000 Lb Bridge Crane w/ Approx 18′ Span, Yale 3-Ton Cap Electric Hoist. 4000 Lb Cap Bridge Crane w/ Approx 33′ Span, P & H 4000 Lb Cap Electric Hoist. 2 Ton Bridge Crane w/ Approx 15′ Span, Yale 2 Ton Electric Hoist. 2 Ton Jib Crane w/ Robins Electric Hoist. Attachment, Tailstock with Live Chuck, Steady Rest, 47″ 4-Jaw Chuck. Monarch 24-M 24″ x 312″ Geared Head Lathe s/n 6801 w/ 1.5-68 RPM, Inch Threading, Taper Attachment, Tailstock with Live Chuck, Steady Rest, 24″ 4-Jaw Chuck. Attachment, Tailstock, 15″ 3-Jaw Chuck. American Pacemaker 16″ x 54″ Lathe s/n 69345-46 w/ 30-2000 RPM, Inch Threading, Taper Attachment, Tailstock, Steady Rest, 10″ 3-Jaw Chuck. Harley “13 Harley” mdl. HP753 13″ Automatic Threading Machine s/n 3046 w/ 4.5-13.1 RPM, 13″ Threading Cap, 38 1/2″ 3-Jaw Main and Sub Chucks. Landis Automatic Threading Machine s/n 48CL1B-21 w/ 4″ Thru Bore. Landis Automatic Threading Machine s/n NA w/ 1 1/2″ Thru Bore. Shibaura mdl. BT-8DR Horizontal Boring Mill s/n 50061 w/ 20-1000 RPM, Power Feeds, 35 1/4″ x 41 1/4″ Table, 19 1/2″ Chuck. TOS Varnsdorf Type W75 Horizontal Boring Mill s/n 06-03 1988 w/ 18-1800 RPM, 37 1/2″ x 37 1/2″ Table, Power Feeds, 18 1/2″ Chuck. Betts Machine 68″ Vertical Boring Mill w/ Compound Boring Head, 68″ 6-Jaw Chuck. 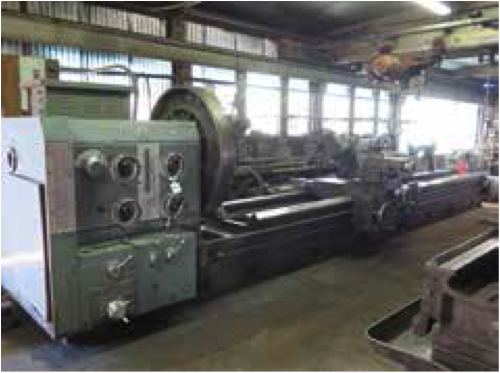 Cincinnati 48″ Vertical Boring Mill s/n 4498 w/ 2.1-50.5 RPM, 48″ 4-Jaw Chuck, Compound Boring Head. Cincinnati Bickford 14″ Column x 60″ Radial Arm Drill s/n 4E1059 w/ Power Column and Feeds, Secondary Work Table. Carlton 13″ Column x 5′ Radial Arm Drill w/ 10-1000 RPM, Power Column and Feeds. Soraluce mdl. TRO-1250 10″ Column x 39″ Radial Arm Drill s/n 1366-1576 w/ 29-1700 RPM, Power Column and Feeds. Van Norman Compound Vertical Mill s/n 5492 w/ 30-1200 RPM, Compound Vertical Head, Power Feeds. Cincinnati Toolmaster Vertical Mill 85-3800 Dial RPM, Power Feeds, Vise. Cincinnati No.4 Vertical Mill s/n 2A4V1J-4 w/ Power Feeds. W.F.Wells mdl. G-30 30″ Twin Beam Horizontal Band Saw s/n G7819-A1096. DoAll mdl. 2012-2H 20″ Vertical Band Saw s/n 383-89323 w/ Blade Welder, Dial FPM and Acces. Wells No.12 12″ Horizontal Band Saw. Sheldon 12″ Shaper s/n 8-8749 W 12″ Stroke, Vise. Doelger & Kirsten No.2 Mechanical Shear. Fox 20″ Swing Saw w/ Hoist and Trolley. Fox mdl. 1095 Swing Grinder w/ Hoist and Trolley. Joy Twistair Air Compressor s/n 117313. Hydraulic Tube Bender w/ Acces. Power Team 55 Ton Electric Hydraulic H-Frame Press. Oliver mdl 600 DG Large Diameter Drill Sharpener. Hammond No. 10 10″ Tool Grinder. Baldor 1.5Hp 10″ Pedestal Grinder. Waldon 6000B Diesel Powered Articulating Bucket Lift. Diesel Powered Articulating Bucket Lift. Clark CPS25MC 5000 Lb Cap LPG Forklift w/ Grabber/Rotator. Allis Chalmers APC-50K D 2PS 5000 Lb Cap Diesel Forklift s/n AQK521716. Clark GPX25C 5000 Lb Cap Diesel Forklift s/n GPX23C-0042-8560KOF. Clark GPS301 4900 Lb Cap LPG Forklift s/n GP1381-0062-9267FB. Clark GPX15E 2700 Lb Cap LPG Forklift s/n CPX127E-0124-9352FB. 2007 Big Tex 9990 Lb Trailer VIN# 16VPX162782h89473.